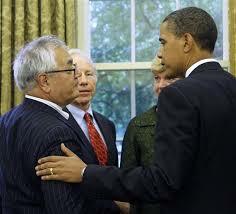 Massachusetts Democrat Barney Franks will not be running for reelection in 2012. Franks blamed redistricting for his decision; however, he had a tougher than expected reelection bid in 2010. However, it probably has more to do with the fact that most of America is on to him and his “fingerprints” that were all over the 2008 financial crisis. Rep. Barney Frank (D-Mass.) announced Monday that he will not seek reelection in 2012, ending a three-decade career in the House. He announced his decision at an afternoon press conference in his hometown of Newton, Mass., where he said redistricting played a major role in his retirement. “I was planning to run again, and then congressional redistricting came,” Frank said. Reelection? Heck, as the Gateway Pundit reminds us, earlier this year Newt Gingrich had suggested that Barney Franks should have been jailed. The post could be subtitled, the rats are fleeing the sinking ship … Frank 17th House Democrat to announce retirement. Double taxation death taxes are AOK for Barney Franks. US Rep. Barry Franks (D-MA) says that high estate taxes are perfectly ok because the heirs did nothing to earn it and that its a pure gift to someone who hasn’t done it on their own and did not work hard. They were just lucky enough to be related to some one who gave them the money. But in the eyes of Liberal Democrats, its just fine for the government to take someone’s money where the government did nothing to earn it or work for it . In fact, the government has already taxed the assets at least once. These liberals would rip the gold fillings from your teeth if possible.